The true avian harbingers of spring, a mixed flock of common grackles, red-winged blackbirds, and brown-headed cowbirds (plus some background blue jays) recorded at Rockefeller State Park Preserve, Sleepy Hollow, NY on February 23, 2016. You can keep your Canada geese. Sure the sound of a flock of musically honking geese flying overhead can bring joy and hope to the hardest heart. But is that a migratory flock headed north for spring, or just the year-round resident flock headed north to the golf course again? What about those flocks heading east, west, and south? So many geese have become untethered from their migratory impulses. How do you tell the harbingers from the "hangers about?" American robin!!? Don't get me started on the American robin. There was a mid-winter roost containing thousands of birds not far from my college in Massachusetts! That robin on your lawn heralds the start of spring? What about the flock of robins in your mulberry tree last month? There is no doubt that the proliferation of ornamental fruit trees (and perhaps global warming) is increasing the numbers of overwintering robins, but even in the olden days, robins were more likely missed by poets, and the general populace, than they were truly absent during the winter. Bluebirds? There are always some of them around during the winter. See robin. The spring song (hey-sweetie) of the black-capped chickadee you say? Well, you might have an argument there. But the chickadee begins to voice its spring song as soon as the light begins to return around the solstice. It is still the dead of winter. Some of the coldest and snowiest days are still ahead of us. That's jumping the gun a bit as far as harbingers go. The fact that spring will return eventually, is not really in dispute. Eastern meadowlarks or some species of flycatcher or another? Sure, sure, if you like coming late to the table. That's like the weatherperson sticking their hand out of the window to tell you its raining. At this point, all your other senses have already told you what you needed to know. The prophet is delivering yesterday's news. Nope. As a resident of both the inland Northeast and inland Mid-Atlantic, I know in my heart that the true harbingers of spring are the flocks of blackbirds that suddenly appear in my neighborhood tree tops. Sometimes they are common grackles, sometimes red-winged blackbirds, and often a mixture of both. Some may find their songs harsh and grating, a cacophony of rusty hinges (though it's always been music to my ears). But you won't find a truer and more prophetic symphony about spring's imminent arrival. The waves of blackbirds move northward at the first sign of winter's grip weakening and the vast machinery of northward migration always begins, perhaps slowly at first, to chug to life behind them. 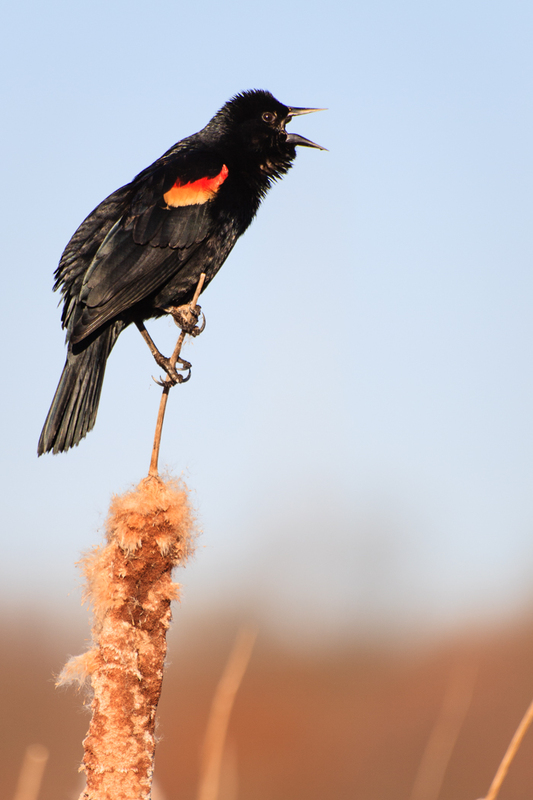 Singing red-winged blackbird perched atop an early spring cattail at Huntley Meadows, Alexandria, VA.
Canon Rebel XTi, Sigma 70-300 f/4-5.6 lens, ISO 100, f/5.6, 1/400th of a second. Migration is well underway! Happy Spring!